Our countdown to back to school is dwindling down quickly. Tonight is open house and school starts in two days. I'm sure we are not the only ones who are hoping for the best year ever -- and a little nervous at the unknown that comes with heading back to school. One way to ensure a great school year is to build an active learning community that involves students, parents, teachers, and administrators. Open house is a wonderful time for teachers to send the message that parents are a valued member of the team. 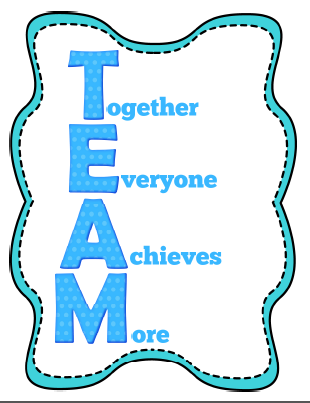 I've created two free printables for teachers to help set the mood for teamwork at meet the teacher night. Structuring a positive environment from the beginning of the year is important for success through out the year. I've been sharing back to school ideas all week that include free printables for parents or teachers. Stop by and pick up the other freebies and check out a few ideas to spruce up your back to school night. Create a team work display at open house. Set out a basket of fresh apples along with a sign that says, "Enjoy an apple." 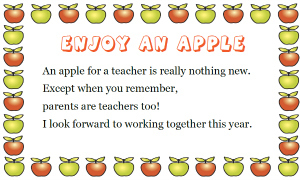 Include this poem for teamwork, "An apple for the teacher is really nothing new. Except when you remember, parents are teachers too!" A teacher friend shared this one year during her open house night and I used it successfully with many groups of parents. The basket of apples provides a nice fall theme touch. I created a free printable with the poem. The adorable apple clip art is from children's book illustrator +Loreen Leedy . Click to get these free printables on google drive. Let parents know they are an important part of the learning community by displaying positive messages around the classroom. I love the acronym T.E.A.M.-- together everyone achieves more. I've created a poster that teachers can post in the classroom or perhaps use in a parent packet. Click to get these free printable posters on google drive. Both the apple handout and the poster are included. Check out my back to school ideas pinterest board for more ideas for meet the teacher night/ open house and ideas for strengthening the home-school connection. I'd love if you follow me on Pinterest while you are there.